Our professionals go through extensive training to handle all types of Yellowknife moves. With Best Movers your items are in great hands! Time is money, our experienced team of Yellowknife office movers are available 24 hours a day to keep your business running full steam even during an office change. We are the Yellowknife leader in Residential Moving. Browse through our website to find our more information. Please give us a call at (867) 446-2653 if you require any additional information! When it comes to Commercial and Office Moving in Yellowknife we are the clear choice. We have been working in Yellowknife for many years, you can place your trust in us! If you need help with your Yellowknife Storage then Best Movers should be the first place that you call! 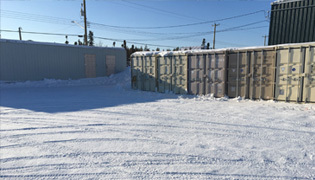 We are premier storage location in Yellowknife. Moving is a stressful event for anyone. From organizing, packing, cleaning, changing your address and all the other preparations that are necessary, moving can be overwhelming. Best Movers can help take some of the pressure away and ease the process of relocating your life. We offer complete professional residential and commercial moving services all across the greater Yellowknife area and beyond. No matter if you are moving locally or long distance, we have the experience and resources to ensure a smooth transition into your new residence or office. Our reputation is based on the trust we have built with our clients. Over the years, we have expanded into a full service moving company with the ability to provide a number of storage options, professional packing services, and a full range of moving options. At Best Movers, we understand the responsibility you entrust us with and we take the greatest of care when handling your belongings. We take steps to make sure there are no hassles, only reduced stress and the results you are looking for. At Best Movers, we aim to offer the most affordable prices for our residential and commercial Yellowknife clients. We personalize our services to match your needs, including specialty services like caring for file folders of important documents. We are a certified moving company with years of experience in all types of relocations. From local to long distance moves, you can rest assured that your belongings will arrive in the same condition they were in when they were carefully packed away for the trip. We adhere to the highest standards of quality, all of our employees are bonded and insured and our record of impeccable customer satisfaction is our greatest accomplishment. If you are planning a move and looking for a trustworthy, reliable moving company in the greater Yellowknife area then contact Best Movers today for a quote. All information provided is provided for information purposes only and does not constitute a legal contract between Best Movers and any person or entity unless otherwise specified. Information is subject to change without prior notice. Although every reasonable effort is made to present current and accurate information, LinkNow™ Media makes no guarantees of any kind.